Annette Devick plays Crystal. Annette is from British Columbia in Canada. She has a Bachelor of Arts in Theatre from Western Washington University, USA, and has attended at the National Circus School in Montreal, Canada, where she trained in: Acrobatics, Unicycle, Artistic Bicycle, Juggling, Handstands, Chinese Chair Balancing, and Clowning. Annette has also trained in Clowning and Bouffon with Philippe Gaulier in Germany and with Grant Heisler in Canada, and has subsequently performed with the Big Apple Circus in New York and through out the USA, and with Cirque Eloize and Cirque Du Soleil in Canada. She has toured with Cirque Du Soleil through Europe and North America. Mark Hudson plays Moontan. Mark trained in acting at Q Theatre in Penrith, N.S.W, Australia, and has subsequently been a guest actor, and a major character in the Australian television series, Water Rats, and various featured characters in A Country Practice. 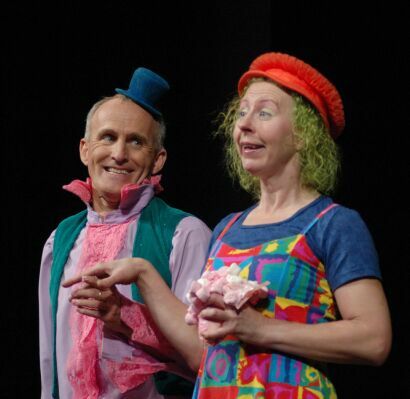 Mark also studied clown and buffoon with Philippe Gaulier, in London and Sydney. He studied mask with Carl Masens, Commedia Dell`Arte at Sydney University, and improvisation with the Bangkel Theatre in Indonesia. He has performed as clown through out Australia at festivals, in theatres, and in indigenous communities. He also directs clown theatre, and has worked with some of the rising stars in Australia, including clowns now working with Cirque Du Soleil. Alan has taught and performed as a clown for 25 years in Europe, America, Australia and New Zealand, and has become a recognised authority on the art form. Alan has also directed and produced theatre for over 20 years in New Zealand, Australia and Europe. Alan taught acting at the Actors Centre in Sydney for eight years, and has experience directing both actors and clowns. He has published four books. His first, Moontan, a Clown’s Story is the basis of this short film. Alan’s latest book, Angels Can Fly, a Modern Clown User Guide, was published last year and was bundled with a DVD. This book is selling well in America and England, in addition to the sales in Australia and New Zealand. Rionn is a proud NZ Maori living in Wanganui. His experience has lead him to working as a cameraman, production personnel for various Television Company’s in New Zealand including TVNZ, Sky TV & the TAB since studying at Avalon Film and Television production school. Rionn has also set up a Videography production company developing Documentary’s, Advertisements, Television programs, and Corporate training DVDs. Rionn has made several Short films submitting them to film festivals around NZ including the Fringe film festival, 48 hour film festival, and our local River City film festival, winning awards. Rionn has also set up several editing and video production workshops for our troubled youth in Wanganui. Andy has worked a camera man, music producer, audio engineer and community television producer for 15 years. Last year he edited and mastered the Angels Can Fly DVD. Michael has a Bachelor of Media and Communications and Film Studies from the University of NSW in Sydney. Working in tandem with an independent production company he last year created Big Fish Little Pond, a documentary on student politics, on which he worked as production manager and editor. Lisa Reweti is a community minded person, within her portfolio are quite a few impressive positions especially concerning Castlecliff. Lisa is the Administrator for two Kohanga within Castlecliff, Te Heti Te Kohanga Reo and Te Heti Kura Te Kohanga Reo. She is currently a Health and Safety officer on the Board of Trustees for Te Kura Kaupapa Maori O Tupoho and Wharekura O Tupoho. She is the Secretary/Treasurer for Taurahere Marae and is head of the Castlecliff Community Marae Development Committee, overseeing the planning and erection of the new establishment, Castlecliff’s own Taurahere Marae Buildings. Lisa is also an NZQA qualified assessor and she is currently assessing the work of students enrolled in Business Studies and Computers within the North Island. Lisa is currently in the process of opening another community project in Castlecliff, BOXON which is a Boxing Gym with an emphasis on Healthy body, Healthy mind. Her greatest accomplishment to date is being a mother of six children. You can also check out Artmedia's digital short film, Moontan (pictured) which was released in 2007 - read the synopsis, check out reviews of the book on which the film is based, and read scene one of the script.